Are you planning a wedding or other special event in New Haven County or the surrounding area? 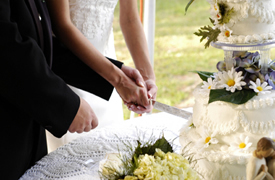 Consider getting an affordable event insurance policy from Advanced American Financial for the occasion. No matter how carefully you plan, things can go wrong. Events often get cancelled after planners have paid non-refundable reservation fees. If your event gets cancelled or rained out, will you still have to pay the caterer, the entertainers and the decorator? Will you still have to foot the bill for the venue? Event insurance can help. Even if your event happens as scheduled, event insurance can help cover unexpected disasters. Event coverage can help you recover lost deposits due to vendor irresponsibility or bankruptcy, damage to photographs or evening attire, and more. In some cases, event liability coverage is also a good idea. What if your guests spill red wine on white upholstery at your wedding reception? What if a guest is injured while dancing? What if you or members of your party are held responsible for costly property damage? All these expenses and more can be covered with the right event insurance policy. It isn’t fun to think of all that could go wrong at a wedding or other special event. However, if you are prepared for disaster, you’ll have a better chance of easily navigating through whatever the special day brings. Call Advanced American Financial today to learn more about our special event insurance.